Extracellular stimuli, such as peptide hormones, growth factors and cytokines, regulate diverse biological functions; including cell cycle progression, proliferation and differentiation, the immune response, and cytoskeletal reorganization, by altering the levels of protein phosphorylation. The initial and crucial event for most signaling pathways inside the cell is protein tyrosine phosphorylation. Indeed, many transmembrane receptors for peptide hormones and growth factors possess intrinsic protein tyrosine kinase (PTK) activity (see Chapters 4 and 5). Receptors for cytokines (see Chapters 6 to 8) lack intrinsic kinase activity but associate with non-receptor PTKs inside the cell. Levels of cellular protein tyrosine phosphorylation are regulated by two opposing activities catalyzed by PTKs and protein tyrosine phosphatases (PTPs). PTKs have been studied extensively for the past two decades . However, the importance of PTPs has not been fully appreciated until recently. The addition or removal of a phosphoryl moiety from tyrosine residue(s) in a protein can generate novel recognition motifs that regulate protein-protein interactions, control protein stability, and most importantly, modulate enzyme activity. Phosphorylation is usually regarded as an “on” switch to activate a signal transduction pathway, while dephosphorylation as an “off” switch. However, this is not always the case. 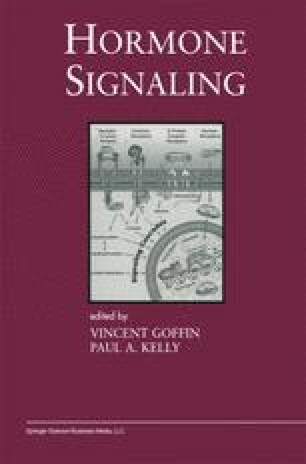 As will be discussed below, PTPs can exert both positive and negative effects on a signaling pathway (see Chapter 1). Often, the critical factor is the balance of phosphorylation, which dictates the extent and duration of an extracellular signal event. To fully understand the fundamental role of protein tyrosine phosphorylation in complex and critical signal transduction pathways, detailed studies of both PTKs and PTPs are required.